Marpac Yogabed Mattress Review – For Sleep or Yoga?! First things first: No, you CANNOT do yoga on this mattress. But this Yogabed mattress could be the perfect solution for you if you love your beds stylish, comfortable, and of reasonable price. Here’s my Yogabed mattress review on how the it performed under my strict (semi-professional) scrutiny. 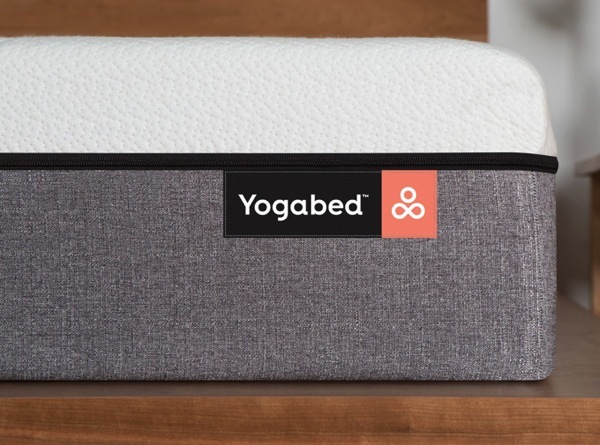 While some online mattress companies settle with using the typical foam, Yogabed outdoes them by creating their own proprietary foam. Each piece of foam on the 4-layer mattress is designed with a purpose. Top Layer – 0.75-inch thick “Yoga Instant Response” foam. What does this layer do? It works to provide comfort while also relieving the pressure you feel when you sleep. Being the top layer, it will come in contact with your body the most. Yogabed has made it to be completely responsive to your every movement. If you love tossing and turning come 12 midnight, you won’t have a problem when this foam is underneath you. Middle Layer – 1.75-inch thick YogaGel. This foam layer makes sure you sleep like a comfortable baby at night by providing a gentle cooling effect. It also submits and supports like the first layer without retaining any heat. In other words, you get a restful shut eye each time. Third Layer – 6.5-inch thick high density foam. Breathable, durable and supportive, the Yogabed mattress knows how to make each foam layer complement the next. Fourth Layer – 1.0-inch thick super high-density foam. This is added to provide a sturdy base. 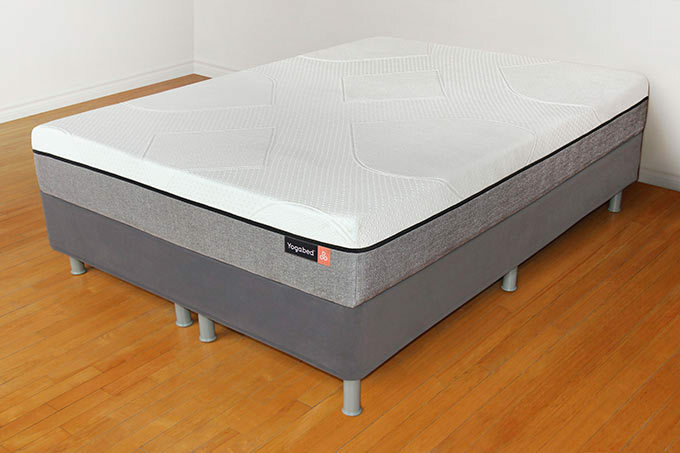 Although the third foam layer provides height and support, this one exists to ensure durability especially when you’re prone to moving the mattress around in your room like me. “Oooh, the cover!” is what you may initially say to yourself after you unfurled the queen sized Yogabed mattress in your room. Seriously, it’s one of the more unique ones out there. Design-wise, the top part of the mattress cover is white and includes a lovely textured pattern composed of circles. It’s actually reminiscent of a quilt-like design. The lower half, on the other hand, is done in dark grey thick fabric. The best part? It’s so easy to remove! There’s a tiny zip running along the mattress so all you have to do is unzip it and out the cover goes for washing or for checking out the foam underneath. A Gentle Hug – The firmness is just right but it doesn’t mean there’s no love coming from the mattress. This isn’t the Sarlacc Pit of the mattress world (where my Star Wars nerds at??? ), but it does offer quite a bit of hug (1.5-inches to be exact.) This is enough to make you comfortable without making you feel like you’re drowning. Instant Comfort – Creating their own proprietary foams has done Yogabed plenty of good. I’ve heard raves for their Yoga Instant Response Foam before but I just dismissed it as hype. Slept through the bed the first night it came, by morning, I was a convert! The top foam layer is absolutely perfect if you want foam that quickly conforms to even your slightest movement. Although I’m not a fussy sleeper normally, when I sleep on new mattresses, I do have a tendency to toss and turn at night. Out of the mattresses I tried out, the Yogabed was the only one that made me feel comfortable within seconds every time I would settle in a new position. It’s not for everyone though as I’ve read people complaining about this same quality of the mattress. A Lot Cooler – No, I don’t mean “cool” as in “awesome cool”, but cool like “temperature cool.” It’s a lot easier to sleep tight at night when the bed doesn’t try to burn you. Their cooling layer, the YogaGel is a neat little innovation. It’s also noticeably cooler than when I slept on the Tuft & Needle mattress. Free Pillows! – You get two thin but ample memory pillows to go with your new Yogabed mattress. These are great if you like sleeping on your side or your stomach. 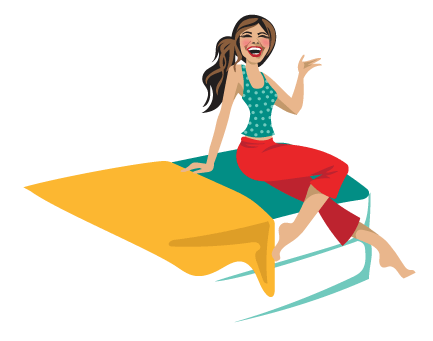 101 Return Policy and Price – The Yogabed mattress knows how to provide a good deal so it’s natural they’re giving away their mattress at competitive prices as well. A Twin will cost you $599 (cheaper if you have a discount code), while a King can cost around $949. Returns are accepted within 101 days. Yes, one day more than those offered by Casper, Leesa and most other direct-to-consumer mattress companies. They will ask you to donate your mattress to a charity, or sometimes they’ll offer a pickup. And then you can get a refund. Sounds easy enough. It’s a low-risk investment, so you shouldn’t be afraid to try out the mattress even if you’re not sure if you would like it or not. The Smell – Okay, so all new mattresses have a distinct “new mattress” smell. Some, like those in the Leesa mattress, dissipates quite quickly, like an hour or two after opening. Then there’s the one in Yogabed. It took three full days before I got used to it and almost an entire week for it to completely disappear. If smells are something you are not happy with, I suggest you air this out first before using. Too Firm for Some – Although it wasn’t my experience, I’ve heard people complain that the bed was too firm for them so it’s worth noting it. Our bodies are made differently after all and on occasion, we do feel pressure differently from others. Should you get a Yogabed mattress? Well, if you like a mattress that gives you a bit of hug when you sleep, I would say yes. It’s also for you if you don’t mind simply having one firmness option in your bed (something many e-commerce mattress companies are doing more and more). On the other hand, I would say, no, if you hate any of these and you’re sensitive to the firmness levels of a mattress. No, if you want a bouncy feeling that a hybrid mattress can give to you. If so, it’s best to seek alternatives from the Yogabed. You can go for a company where you get to choose between firmness levels (Nest Bedding) or even one that lets you customize it (Helix Sleep). I wasn’t sure about a foam mattress but I figured why not test it out with their 101 night trial. So I dove in and bought their queen sized mattress on their personal website. On my original mattress I had a hard time falling and staying asleep. Now with the Yogabed I fall asleep in no time. Sometimes I have to ask my boyfriend when I fell asleep because I fall asleep so fast! The mattress is firm but I personally sink in about an inch which gives a nice hug on my body. So I will be keeping my Yogabed! We’ve had the king bed for about 3 weeks. It was a bit firm at first but has softened up some. Now it’s very comfortable. Very fast shipping, we had it in a few days. My husband and I were extremely happy to get our yogabed. The price was on point 750.00 you can’t beat that. Unfortunately the bed was super soft and we grew to dislike it. The return process has been stressful. We sincerely regret doing business with this company.